Girls Like Flours | Food It Yourself! 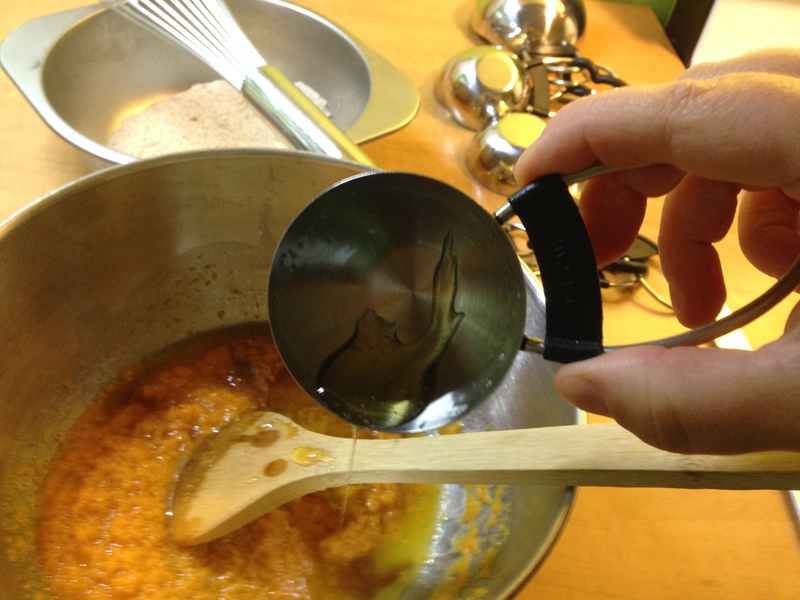 Last week I made some pretty tasty sweet potato candy using coconut flour. This left me with a small problem. I now own a one pound bag of coconut flour. What to do with it? As usual I turned to the internet. Coconut flour, for those who are not familiar, is just dried coconut that has been ground very fine. It is a gluten free flour, which is important if you have a physician diagnosed wheat allergy, gluten sensitivity, or celiac disease. Here are the nutrition facts labels for 2Tablespoons / 1 oz. 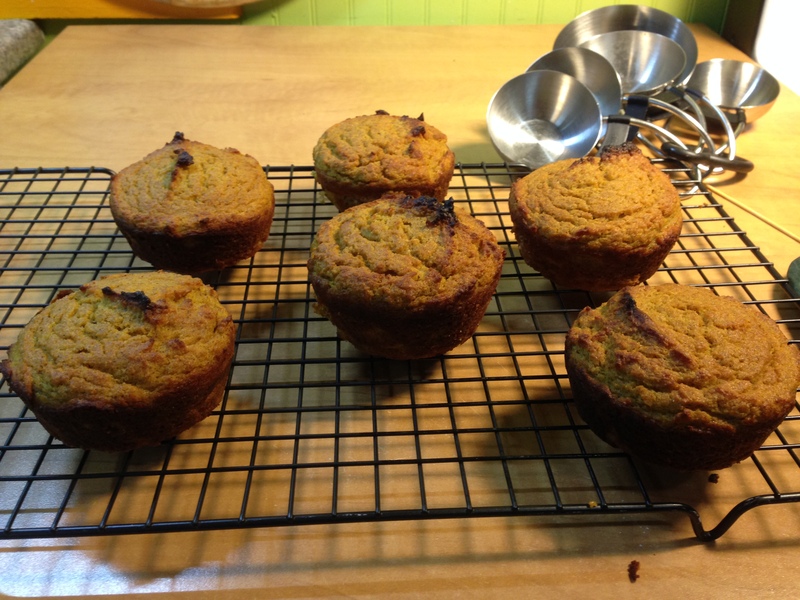 /28 g wheat flour vs coconut flour, as generated by Self Magazine’s nutrition data site. 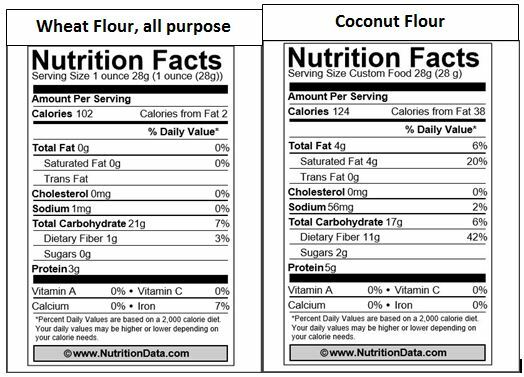 As you can see, the coconut flour is a bit higher in calories and protein than wheat flour. It is also higher in fat and fiber. These are neither deal makers nor breakers for me, but they may be important to consider if you have special diet needs. If you like the taste of coconut it is certainly worth playing around with. I selected this recipe from the Homemade Mommy blog by Lindsey Gremont. Why this recipe? Except for the coconut flour the recipe uses ingredients that most of us keep around all the time, plus some pumpkin which is really easy to find this time of year. At first glance, the recipe struck me as a little odd. 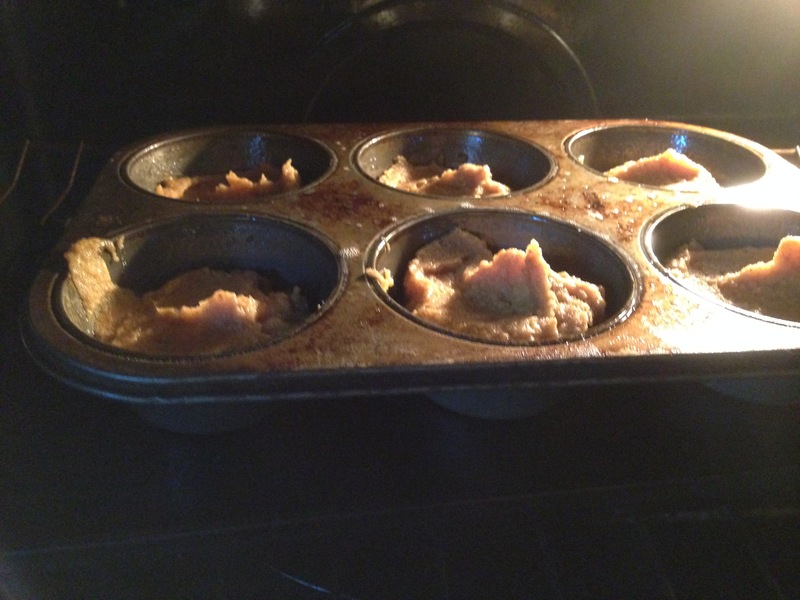 My usual muffin recipe uses two and a half cups of wheat flour and one egg. This one uses one half cup of coconut flour and six eggs. What gives? 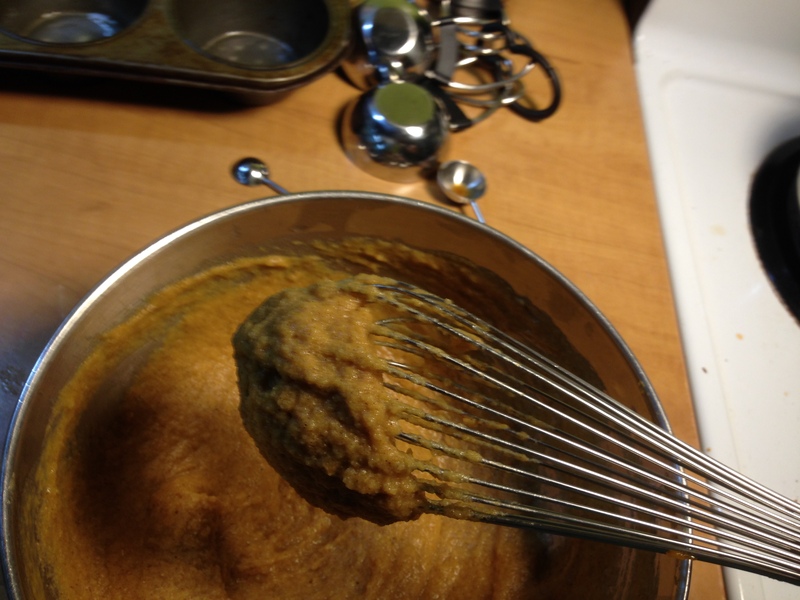 Coconut flour and wheat flour behave very differently in recipes. The Coconut Mama, who really seems to know her coconut flour, explains here that coconut flour absorbs more moisture than wheat flour. If my memory of food science serves me, this also explains the large increase in eggs. Eggs add moisture. The protein from the egg white will add bulk and structure to the muffins, two things wheat flour usually does. As a spice enthusiast, I always keep cardamom around the house, but only as whole seeds. 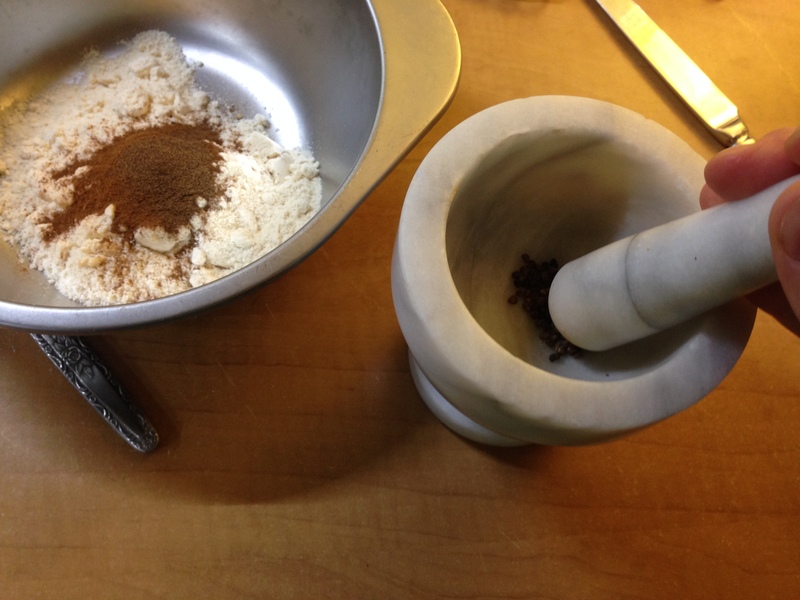 My trusty mortar and pestle made quick work of them. WOW! Coconut Mama was right. That little bit of flour soaked up the moisture very quickly. The final batter had the texture of mashed potatoes. That is with six eggs in the liquid ingredients. I was not expecting that. Feeling a bit indulgent, I used my oversized muffin tin for this. See you in 16-18 minutes. The oversized muffins took a few extra minutes, but they emerged from the oven looking quite lovely. Here they are cooling off and awaiting a taste test. Mr. Food It Yourself bravely agreed to taste them with me. Even with the spices and pumpkin there was a distinctive coconut flavor, but it was not overpowering. The texture was very, very different from a wheat flour muffin. It was denser but not really heavy, which I think is from the egg protein. Over all, we enjoyed them. This is good because I still have most of that bag of flour to use up. Until science gathers evidence to the contrary I will remain suspicious of the benefits of a grain-free diet for average, healthy humans. However, there is no reason not to try recipes that use alternative ingredients like coconut flour, almond flour, or soy flour. Trying new ingredients will expand your cooking skills and expose you to interesting new ingredients. Give it a try! What is your favorite grain substituted baked good? Share in the comments section!